We explore one of the more interesting menus of Eating World Food Court at Gourmet Sizzling Plate. While it's never seems as busy as the infamous Gumshara stall next door, Gourmet Sizzling Plate certainly has it's fans. The menu has quite a few dishes we've never tried before which is always a plus in our books. The shandong chicken and the twice cooked pork were the stars of the show for us. One thing that puzzled us is that for a 'sizzling plate' joint few of the dishes seemed to actually sizzle when served, even though they were served on a hot plate with plenty of oil. So if you're particularly after sizzle you might want to ask for it. Whole fish with pickled vegetables and jelly noodles - $14. This hot pot is certainly big enough for two. There's a whole fish in there and mound of pickled veggies, mushrooms and silken tofu. The broth is unusual: a little peppery, mustard-y and sour from the pickled vegetables, it's not for everyone but we certainly enjoyed giving it a try, and it was great value, we'd expect to pay $25 for something like this in a restaurant. Shandong chicken - $10. 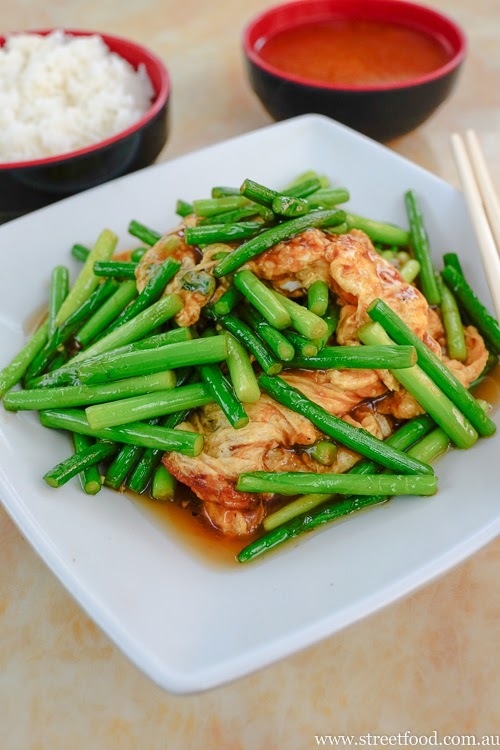 Now this dish is for everybody - fried chook sitting in a lovely sweet soy sauce. Joy. 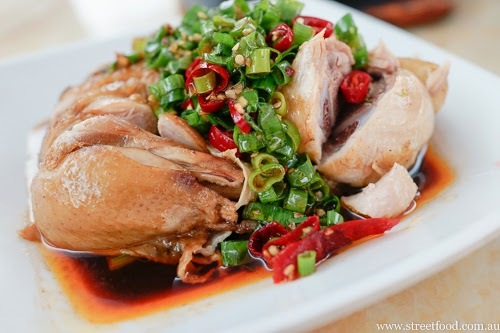 Steamed chicken with chili sauce - $9.80 (or $5.80 small). Shawn nips in for a quick healthy lunch of steamed protein and rice but was surprised to find the delicious chook swimming in oil. Enjoyable but best shared, the small size would be better for one person. Double cooked pork with veggies - $10.80. This was sensational - the pork has a a gorgeous 'roast pork' flavour to it, twice cooked meat dishes are often a winner. Marinated beef and potato hot pot - $10.80. Yummy but not mind blowing, hearty chewy chunks of beef and lovely soft tatties. Mr Shawn waddled into Chinatown with a fetish for Kangkong with beef - $9. This dish is simple but full of soul, we got hooked on it in Hong Kong. 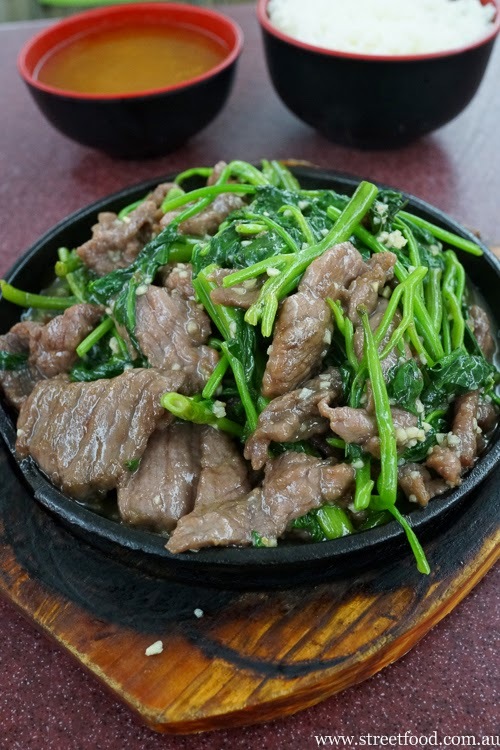 Simply stir fried beef with water spinach and a good handful of garlic. Stir fried garlic shoots and egg - $9.50. A handful of garlic shoots fried up with an omelette we with a sauce of (we guess) soy, sugar, a good schplozzle of oil and plenty of crushed garlic. A mid-week wonder. 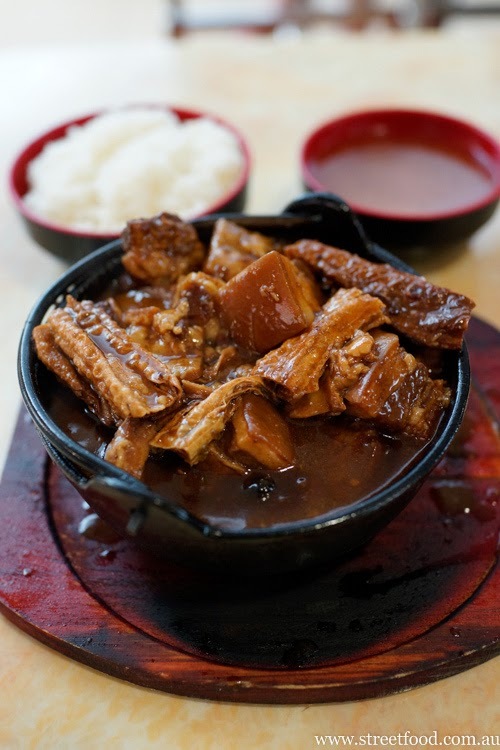 Marinated pork & bean curd sticks hotpot - $11.80. The uber fatty pork belly is too rich for us after a couple of pieces, but it lends a wonderful porkiness to the thick brown sauce, which has a kick from some star anise. The bean curd sticks are tofu skins, tofu skins are always awesome. The Double cooked pork with veggies is still a winner, and still $10.80. It was spicier than we remember, it has chili, some Szechuan pepper and black beans. 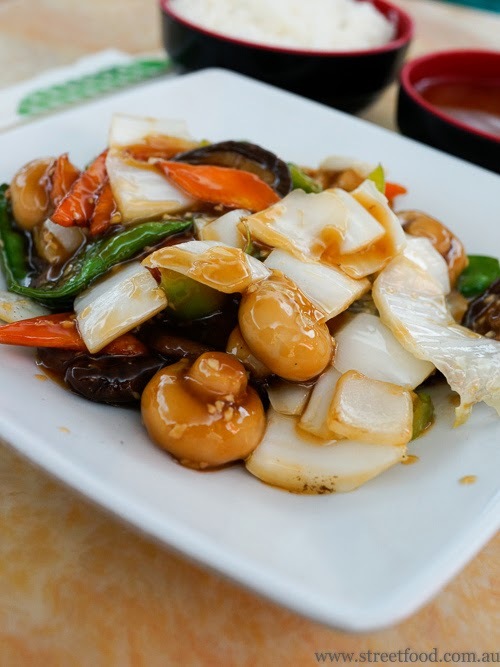 Stir fried mushrooms & veges - $10.80. 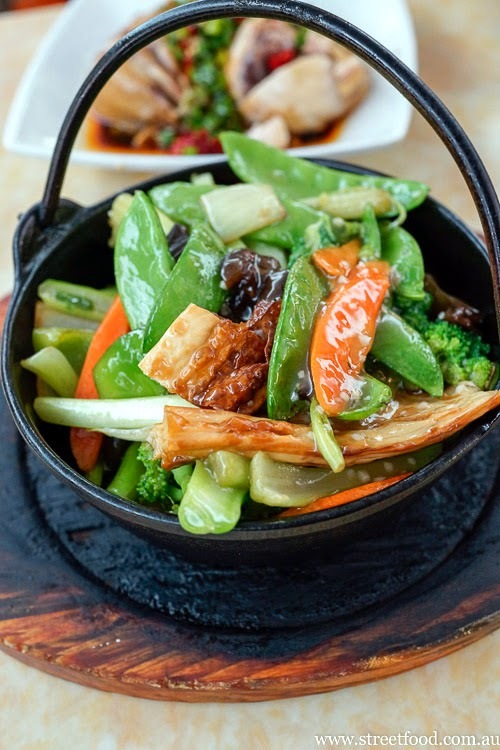 Two types of mushroom with mixed veggies in brown sauce with a good dash of minced garlic. Steamed chicken with chili - $9.80. Steamed chicken in sauce of soy, vinegar and oil, with shallots and chili on top. This version isn't as oily as last time we had it. Underneath the chook there's a handful of Chinese greens that have soaked up the sauce. Yeah baby. Vegetarians hotpot - $9.80. A simple dish of mixed veggies, mushrooms and tofu skins (yum!) in garlic. This goes well with the oilier chicken dish. Eating World Food Court is at 25-29 Dixon St, Haymarket\Chinatown. 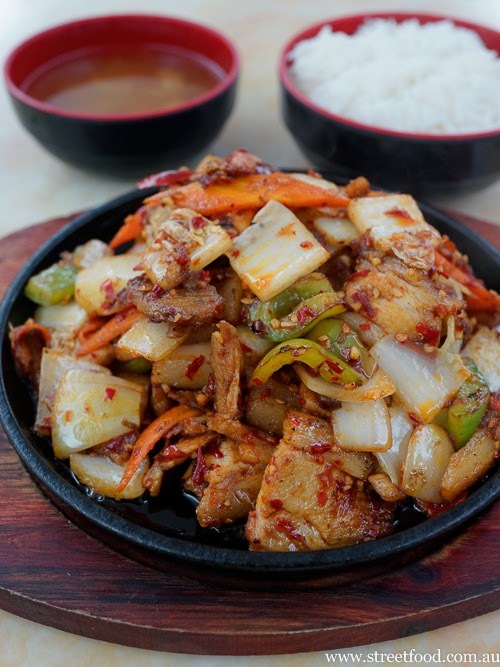 Love sizzling plates although I rarely order them, but the shandong chook and the pork looks excellent, and cheap! Ooooooh! Does it sizzle like pepper lunch? I love a good sizzling plate.